Dixie Bell Louise Paulson, 86, of Fort Dodge passed away Sunday, October 21, 2018 at Unity Point Trinity Regional Medical Center. Funeral services will be 10:30 a.m. Saturday, October 27, 2018 at St. Paul Lutheran Church with Rev. Allen Henderson officiating. Burial will follow at North Lawn Cemetery. A visitation will be 5:00 to 7:00 p.m. Friday at Laufersweiler-Sievers Funeral Home. Dixie is preceded in death by her parents, George and Jennie (Andersen) Hubbard; her beloved husband of 54 years, Orvin; brothers, Art; Wilbur; Bill; Fred and Donald Hubbard; sisters, Violet McGuire; Valeeta Cooper; an infant sister, Ellen Hubbard and infant great-grandson, Potter Payne. Fort Dodge where they made their home. Dixie centered her life around her children, family and friends. 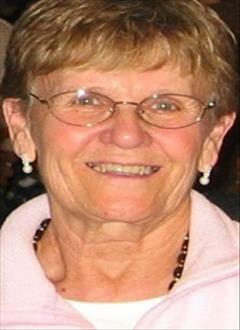 She was a housewife, mother and devoted Christian belonging to St. Paul's Lutheran Church. Dixie loved writing poetry, walking the trails, shopping, bingo and spending time with her grandchildren. She was fun to be around and had a great sense of humor. She loved people and treated all with dignity whether the person on the street was down on his luck or anyone else. She always had time with a cup of coffee in her hands and a smile on her face to stop and talk to people to brighten their day just a little. Dixie was diagnosed with Alzheimers and had lived at Friendship Haven the last five years. There, she received wonderful care from a team of compassionate people. My deepest sympathy to you and your family Bruce. Bob Schmeling. Remembering all the fun and happy times our families spent together. Dixie was a classy friend whom I met in High School through my friendship with Bruce. I have such fond memories of her and the way she could make me laugh. We so enjoyed her and Orv staying with us for 6 weeks after his surgery. They were like family for Mary and I. May you rest in piece my friend. I hope the fond memories we all have will sustain us in the weeks and months ahead. The attached photos are added to the memorial of Dixie Louise Paulson to help share their legacy. Please help memorize Dixie Louise Paulson by recording your attendance below.